"This casserole is wonderful for a backyard picnic. 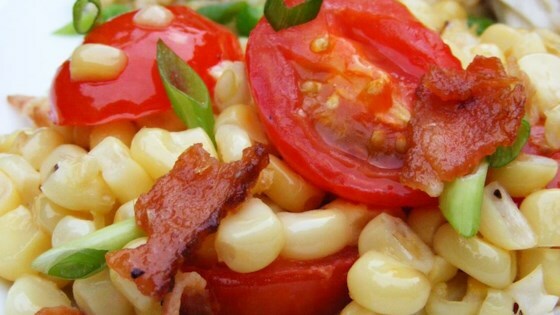 It uses all fresh ingredients and simply contains corn, tomatoes and bacon. A great complement for a barbecue." Preheat oven to 350 degrees F (175 degrees C). Place bacon in a large, deep skillet. Cook over medium-high heat until crisp and evenly brown; drain. Chop bacon, and set aside. Cut corn from cobs. There should be about 4 or 5 cups of corn kernels. Melt butter in a large skillet over medium heat. Add the corn, and cook for about 5 minutes, stirring constantly. Stir in the bacon and salt, and remove from heat. Spread a layer of the corn mixture into the bottom of a 2-quart casserole dish, then layer with tomatoes. Repeat layers twice, ending with tomatoes on the top. Bake uncovered in preheated oven for 30 minutes, or until corn is tender. See how to make seared scallops with easy, no-cream fresh corn cream. This was good the day I made it but the leftovers were soggy. Kudos Ronda. My husband and I loved this recipe. The only thing I'll do differently the next time is peel the tomatoes. The skin is tough after baking. Very tasty, I added some chopped onion to the cornwhile cooking it before the baking process. I made individual servings in small gratin dishes. Great. Didn't change a thing - it came out really good.